Let me be the first to say, I read the words “chocolate diet” and squealed with delight. So I started checking it out. First let me say, there are benefits to adding, or should I say keeping, chocolate into a diet plan. There have been actual studies showing the results to be desirable, and those who had an intake of chocolate two or three times a week in small amounts had lower BMI‘s and were an average of 5 to 7 pounds lighter than their counterparts. options with your doctor before beginning. 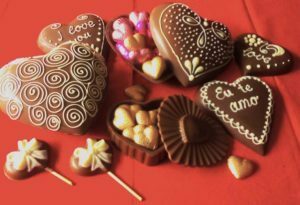 Now, if you already eat chocolate on a regular basis, you may want to consider the advice given here, and reading some articles on the subject and you may find a reason to eat your chocolate in moderation. There is conflicting information about what type of chocolate is best, I personally prefer that article that I will be talking about in a moment that says all tastes; dark, milk, and white are equal. Chocolate Diet! How Much is Good for Me? Now first you must make sure you already have a healthy eating plan in place, establish an exercise routine that works for you, and then decide where to add the chocolate. Really the options are limitless. You can have your chocolate daily, but your amounts would be smaller. If you opt for twice a week, you could eat more, but still be reasonable, only a square or two is necessary. You do not want to overdo it because then you would only be giving the nay-Sayers ammo. What Do the Experts Say About a Chocolate Diet? In a study by Dr. Golomb, in “The Chocolate Diet”, chocolate was found to be an asset in lowering the body’s B.M.I. There have been studies that have shown chocolate to lower cholesterol, lower blood pressure, and even regulate the body’s insulin. It is most likely the antioxidants found in the chocolate that is so beneficial. But who are we to argue, right. I understand that some of you are saying, man these chocoholics will find any way they can to get their chocolate and say they are losing weight because of it right? Well, how cool is it, that there is actually proof of it working. As with any concept though, it must be kept in moderation, and you must be able to resist eating the whole bar of chocolate and you must be able to avoid letting the chocolate treat lead you to other sweets. Remember, there is an actual ingredient in chocolate that helps our bodies, it is the antioxidants. You will not be able to use that excuse with your donuts, chips, french fries, etc. I suggest if you are going to add chocolate as a treat, then use it as such. Pick your time you will eat it each day, and make a production of it. This will in turn give you more of a treat than just the taste of the chocolate going down. It will be a relaxing, mental vacation from the world. I personally, agree with the suggestion of eating a square of chocolate and letting it melt in your mouth rather than chewing it. I have done this before many times when I was trying to limit my chocolate intake because of my diabetes, and it does work. It makes you enjoy it more and you are not left wanting more afterward. You feel satisfied. Chocolate Diet! Does it Sound too Good to be True? For more information on the Chocolate Diet you can look it up on the internet, you can ask your doctor or nutritionist for information and you can check out your local library. Does your research as with any diet, do the chocolate thing in moderation, spread the word to the non-believers, and enjoy your chocolate. Yeah for us, we can have our chocolate and eat it too!